KASANDA – Angry mourners in Myanzi, Kasanda District, on Monday afternoon chased a group of senior police officers, including Political Commissar Asan Kasingye, from the burial of Samuel Ssekiziyivu, who was shot during the protests in Mityana Municipality on Sunday. Ssekiziyivu, a football fan, was hit by a stray bullet while travelling in a taxi as it passed through the town where residents were demonstrating over what they called torture of their representative in Parliament, Mr Francis Zaake, who is currently admitted to Lubaga Hospital in critical condition following beatings he sustained during the violence that marred the Arua Municipality by-election last week. Five other passengers were injured by bullets. The victims, who were taken Mulago referral Hospital, are Lawrence Jjingo, Jala Nakiryowa, Derrick Ssengooba, Reagan Muwonge and David Asiimwe. And on Monday, the senior police officers, who had come to commiserate with the family were chased away by the angry mourners who accused police of brutality and being insensitive to people. As the officers left, some mourners also threw stones at them. They later boarded their vehicles and left. 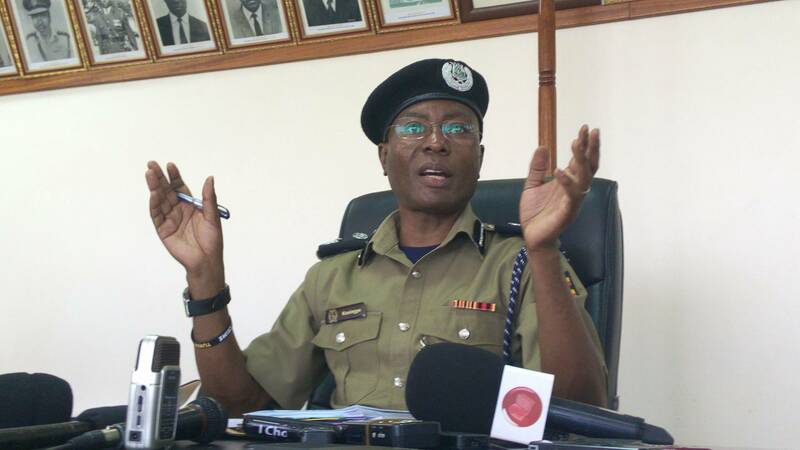 The incident happened as the Inspector General of Police Martins Okoth-Ochola revealed that two police officers who opened fire on the taxi face charges of murder and attempted murder. Ochola said the cops would be produced in court to answer the charges once investigations are complete.